Comments: Great Blue Herons are the largest and most common heron across the region. They build large, stick nests in trees, heavy brush or on the ground. They may nest as an isolated pair, in a single species colony or in multispecies colonies with other wading birds. They are primarily fish eaters, but also eat amphibians, reptiles and occasionally small birds and mammals. 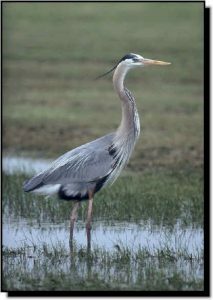 Larger size and coloration can be used to distinguish Great Blue Herons from Reddish and Tricolored herons. In flight they carry their neck coiled rather than straight, which distinguishes them from cranes. Great White Herons, currently considered white color morphs, are found along the Atlantic and Gulf coasts. They are distinguished from the Great Egret and white morph Reddish Egret by their yellow legs and heavy yellow bills. Würdemann’s Herons, hybrids between Great Blue Herons and Great White Herons, appear as intermediate in color. Both Great White and Würdemann’s herons are rare in the Great Plains.